in Surrey, Kent, London & Home Counties. Is your house or business in need of rendering repairs? Are those ugly scars or bodged DIY repairs making your property look ugly? 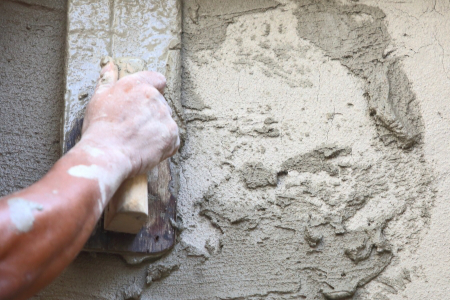 Getting your external wall rendered not only helps to keep out damp and remove ugly cracks and patched repairs but can actually add to the value of your home. Why keeping your wall rendering in top condition is beneficial. Rendering is an age old process adopted from Southern Europe that provides the outer walls of your home with protection from the wind, rain, and other erosive weather. Other benefits associated with external wall rendering include increased home insulation and will transform the look of your home. To give your property the best protection you might want to look at the application of an external wall coating to enhance the look and add additional protection – this is an extremely worthwhile process! Brixseal can perform rendering repairs for your property to ensure your house is looking its best. Take a look here at the whole process. Brixseal will carry out the following procedure when rendering your walls so as to ensure we get the best possible result. We will ensure your walls are clean and free from algae/mould and plant/fungi growth. Once that is done we can apply resin for small cracks or crack stitching for larger cracks. Blown/damaged render will need to be totally removed. A coat of render can then be applied and left for a few days after which, a stabilising coat is applied . Brixseal can apply a render mixture in a smooth or textured finish. An undercoat is then applied in preparation to apply the Andura Classic 21 exterior wall coating which is the final stage of our wall coating process. If you choose to have your exterior walls coated you can view the complete process here. If you want to re-render external walls, building regulations may apply depending on the extent of the work. Where 25 per cent or more of an external wall is re-rendered the regulations would normally apply. Brixseal will help you with this. Once we have applied the rendering on your property we offer a very competitively priced exterior wall coating service to protect your home or commercial premises.